I just downloaded the client today and was having the same issue. Was required to update java and then was told my security settings were too high. I added the two exceptions mentioned earlier in the thread but they didn't work. You get this before the client opens. 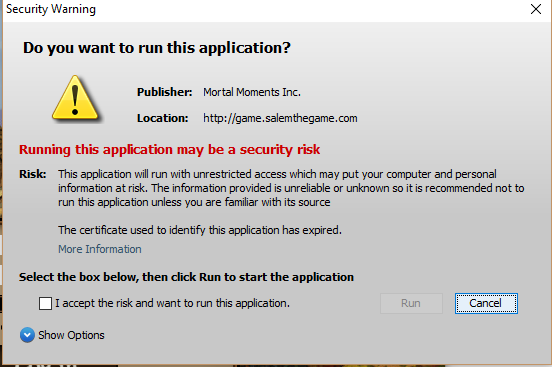 Confirming that http://game.salemthegame.com works with windows 10 and the newest(as of 9/17/16)java. Weird, I've pm'ed John/Meow about this issue to make sure they notice - maybe the RSA key expired or something. Kind of annoying if you don't know about this. I do not work in Windows 10. I write something about open GL, although all the drivers have been updated. I get the java security alert when I launch the game, I tell it to run the application, log in then black screen and nothing happens. Tried 32 and 64 bit versions of java, added all the security exceptions ever mentioned in this thread including http://game.salemthegame.com, turned off both router and windows firewall and antivirus, still no luck. I am running windows 10 64bit and the latest version of java (8.151). How to fix it? Any idea?